Orson Welles once described a movie studio as the biggest toy train set any boy ever had. This seems particularly apt when considering the filmography of Michael Bay, who has crafted a cinematic career by using tentpole filmmaking as a chance to indulge his own often immature impulses and promote some childishly simplistic views of masculinity, sexuality, gender, race, patriotism and the incendiary potential of vehicles, buildings, and people. This attitude has resulted in a series of action movies, from Bad Boys to the Transformers films, that are so colorfully outlandish they feel one step away from being animated. But perhaps Bay has just needed the right project to marry his singular style to. Pain & Gain, based on the ludicrous but true case of three Miami bodybuilders who engage in a remarkably incompetent crime spree, has allegedly been a passion project for Bay for a few years, part of his desire to direct what for him would translate to a smaller-scale character piece. Supposedly he only directed Transformers 3 to secure the financing for this film and I never thought I'd say this but it turns out Transformers 3 may have contributed positively to American culture after all. Finally Bay's moviemaking excesses have been channeled into the perfect context. That context? The warped values of our three brawny anti-heroes, starting with trainer Daniel Lugo. Lugo draws no distinction between his views on physical fitness and the American Dream; to him physical perfection and the success that he thinks is intrinsically tied to it are possible for anyone willing to put in the effort. It's a somewhat noble, if simplistic work ethic and we see that Lugo has managed to become a success in his profession, transforming the Miami gym he works at into a popular fitness destination. But unfortunately Lugo has taken on the concept of reach exceeding grasp as a personal motto. Even having reached a level of physical perfection that few can, he's struggling to make ends meet and not regarded as more than the dim gym-rat he is. He wants the kind of good life enjoyed by his new client, sleazy restaurateur and entrepreneur Victor Kershaw. And so Lugo teams up with steroid-abusing trainer Adrian Doorbal (Anthony Mackie) and ex-con Paul Doyle (Dwayne Johnson) to kidnap Kershaw and force him to sign over his considerable assets over to them, an enterprise that Lugo sees as not only improving their lot but serving the public good and supporting American ideals by depriving someone who by Lugo's standards is unworthy. Of course in virtually any film involving a heist, kidnapping or other form of caper, the question is not whether it will succeed but in what way will it go wrong. Here, there's a long list of foul-ups to choose from. Lugo and his associates are consummately incompetent criminals, with their intricately hare-brained plans mostly stolen from movies Lugo has seen. The sole redeeming factor in their scheme is one they could never have forseen: it's so thoroughly and ridiculously idiotic that no member of the law enforcement community can believe it enough to put the pieces together. It'll be fun to pick through the facts of the real case (articles about which can be found here) but even without that knowledge, there's a compelling 'so ridiculous it must be true' quality to the incidents driving the plot forward. In the past, I've usually found Bay's stylistic inclinations and narrative hang-ups were too much of a distraction. His hyper-colorful, blown out visuals, with every frame composed with the care and calculation of an advertising shoot, would always provoke me into awareness that I'm watching a movie. The tension or excitement of an action scene would be broken up by awkwardly-placed puerile humor. Cartoony supporting characters, often racial or gay stereotypes, would invade the narrative for more ill-advised chuckles. Any female character who wasn't a gorgeous supermodel was usually to be mocked and derided. 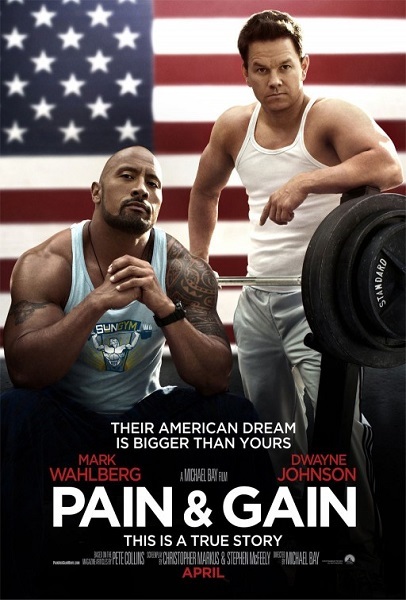 There'd be ham-fisted patriotic imagery, usually courtesy of someone standing in front of a huge American flag as the camera sweeps by (wind machine optional), fetishization of the military, and copious male bonding tempered by hints of homophobia. 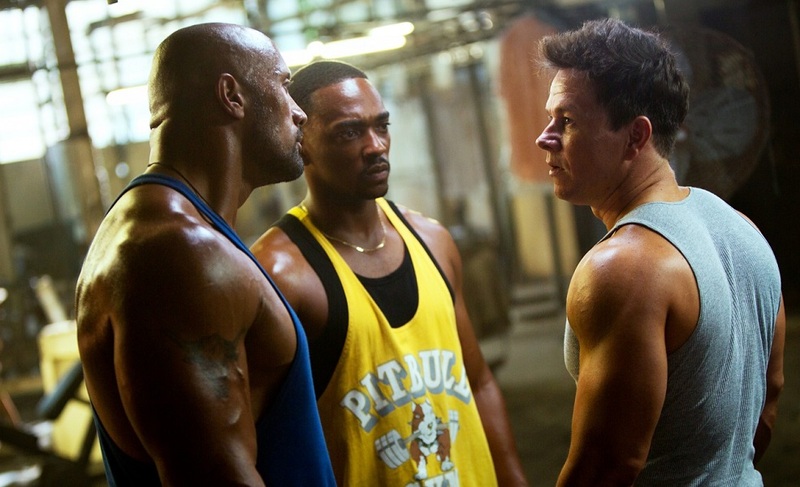 But for Pain & Gain, those directorial drawbacks are suddenly reconfigured into strengths. Here, it's fitting that Bay's overly aggressive camerawork and oversaturated color palette break the reality of the movie because we're not in reality, but the skewed perceptions of its characters. Bay actually pushes the artifice further by breaking the film into multiple narrations from those involved, allowing us to compare their delusions and lack of awareness as each attempts to paint himself as the hero of the story. There's also a hilarious use of onscreen text to comment on the action and occasionally remind us during the story's most extreme moments that this actually happened. The 1994 Miami setting is a bit of a homecoming for Bay, considering his debut film Bad Boys was set there and released in 95, and also allows for some great ironic use of mid-90s tunes. What's really interesting though is how so many of Bay's bad thematic habits are absorbed into our criminal protagonists. His use of racial stereotypes and objectification of women, unpleasant and distasteful in most contexts, reflect his main characters' ignorant mindset. Individually, the three leads seem to reflect Bay's worse traits personified. Let's start with Lugo, whose demented conception of the American dream echoes Bay's form of facile flag-waving nationalism while his obsession with getting into the best shape possible corresponds to Bay's often shallow focus on physical appearance and visuals. Lugo's relentless positivism and self-help seminar determination conceal a nasty sense of entitlement and righteous indignation that the world doesn't seem him as more than he is. In conjunction with his often outspoken defensiveness of his films, this hints at a burning desire in Bay to be taken more seriously as a filmmaker. The casting of Mark Wahlberg, whose onscreen persona can seem almost manically earnest, is quite shrewd. He's great at adapting Lugo's enthusiasm for prodding his gym clients to push their physical limits into his zealous cajoling of his associates toward theft and murder and his charisma makes the reveal of how vile and hypocritical Lugo really is that much more effective. You'd think Lugo should respect Kershaw, a self-made businessman who would seem to qualify as a 'doer' in Lugo's terminology. Instead Lugo, conveniently forgetting his own sordid history swindling retirees of their savings, vilifies him as a criminal, primarily because a man so out-of-shape has the gall to be a success when someone with 2% body fat isn't. The strange collision of male bonding and homophobia in Bay's oeuvre is nicely personified in the sensitivity and explosiveness of Doyle, a perfect role for Johnson and his paradoxically imposing but goofy image. Doyle's resolve to stay straight and sober following a drug-fueled robbery career is sabotaged when the priest giving him shelter comes onto him, leading Doyle to react in instinctive violence. Yet the Christian compassion he acquired in prison and his AA-inspired philosophy lead him to become patronizingly protective of Kershaw, a situation Kershaw eagerly exploits. As the crimes pile up and Doyle gets pulled back into cocaine use and hair-trigger violence, Johnson's wired performance becomes equal parts hilarious and terrifying. Usually cast as cool-headed, sensible characters, often in the military, Anthony Mackie plays most against type of the three as Doorbal, checking his ego to present a portrait of insecure, dim-witted machismo unchecked. Single-minded about his and others' physicality, he has abused steroids to the point of sexual dysfunction, motivating him to join Lugo to fund the requisite therapy to correct this unbearable threat to his manhood. Whenever he has the upper-hand in a situation, Doorbal is pugnacious and arrogant, which makes it all the funnier whenever the tables turn and we see the panic and ineptitude beneath it. His vulnerability in scenes with Rebel Wilson as his nurse makes their burgeoning relationship strangely sweet. In any other Bay film, Kershaw would be a one-dimensional gag but instead the great Tony Shaloub brings an interesting mix of narcissism, industry and helplessness. He is definitely a loathsome human being in how he treats others, but unlike Lugo and his crew, he does have the distinction of having brought himself out of his humble immigrant origins through hard work and ingenuity. Unpleasant as he is, you can't help but sympathize when no ones believes his story. 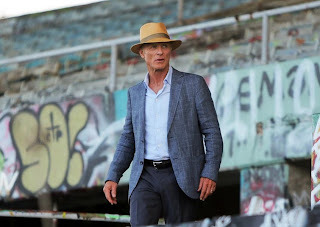 That brings us to Bay's best gag: the sudden intrusion of real life into the film in the form of private detective Ed DuBois (Ed Harris), who is pulled out of the boredom of retirement to investigate the lurid caper. In all of Bay's filmography, DuBois may the closest we've come to a real person, a rational, intelligent man played with quiet decency by an old pro. He lives in a beautiful but classy home with a wife who is attractive and yet not a supermodel. When she nags him in their first scene, it isn't the shrill whine you might expect from the type of female archetype that flourishes in Bay's movies but the type of playful jab that comes from years of marriage together. Whenever Harris comes onscreen, the kinetic, overblown style of the film calms down into something approaching sensory normality. DuBois' presence is proof that Bay knows what he's doing here. He serves as a stark reminder not only this story happened in the real world, but that our three protagonists' existence is so far outside that reality. 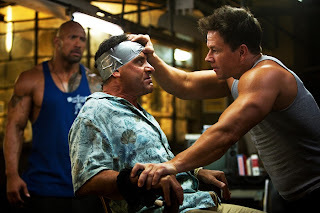 The world Bay depicts in Pain & Gain isn't a particularly friendly or inspiring place and some audiences, particularly those who haven't warmed to Bay's style in the past, may find the story's context isn't enough to justify over two hours of his characteristic assault on the senses. Not being his biggest fan, I was surprised and a bit embarrassed to find myself so highly entertained here, but I have to wonder if Bay will ever find a project so suited to his skillset again. I truly hope he does. Anything that keeps him away from transforming robots is a plus.